The woman is desperate, having tried everything and exhausting her finances. Jesus was her last resort and death would be her final end without His saving solution. 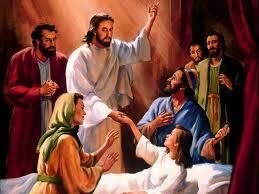 She had made a gesture of faith and by her faith in Him, she was healed. As with most healings, it was the beginning of her going elsewhere and living in peace according to the new purifying experience of believing in Jesus’ saving person and mission. She had been honest and so was Jesus.